Devices that convert AC electromagnetic waves into DC electricity are known as "rectennas." 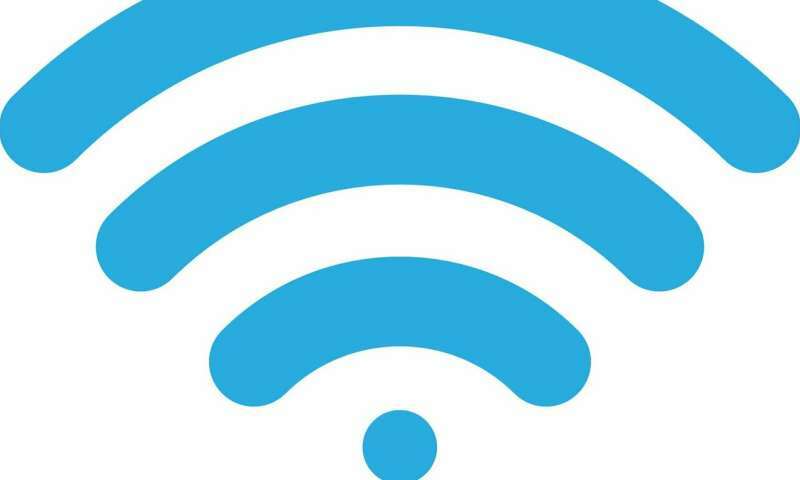 The researchers demonstrate a new kind of rectenna, described in a study appearing in Nature, that uses a flexible radio-frequency (RF) antenna that captures electromagnetic waves—including those carrying Wi-Fi—as AC waveforms. "What if we could develop electronic systems that we wrap around a bridge or cover an entire highway, or the walls of our office and bring electronic intelligence to everything around us? How do you provide energy for those electronics?" says paper co-author Tomás Palacios, a professor in the Department of Electrical Engineering and Computer Science and director of the MIT/MTL Center for Graphene Devices and 2-D Systems in the Microsystems Technology Laboratories. "We have come up with a new way to power the electronics systems of the future—by harvesting Wi-Fi energy in a way that's easily integrated in large areas—to bring intelligence to every object around us." Promising early applications for the proposed rectenna include powering flexible and wearable electronics, medical devices, and sensors for the "internet of things." Flexible smartphones, for instance, are a hot new market for major tech firms. In experiments, the researchers' device can produce about 40 microwatts of power when exposed to the typical power levels of Wi-Fi signals (around 150 microwatts). That's more than enough power to light up a simple mobile display or silicon chips. All rectennas rely on a component known as a "rectifier," which converts the AC input signal into DC power. Traditional rectennas use either silicon or gallium arsenide for the rectifier. These materials can cover the Wi-Fi band, but they are rigid. And, although using these materials to fabricate small devices is relatively inexpensive, using them to cover vast areas, such as the surfaces of buildings and walls, would be cost-prohibitive. Researchers have been trying to fix these problems for a long time. But the few flexible rectennas reported so far operate at low frequencies and can't capture and convert signals in gigahertz frequencies, where most of the relevant cell phone and Wi-Fi signals are. To build their rectifier, the researchers used a novel 2-D material called molybdenum disulfide (MoS2), which at three atoms thick is one of the thinnest semiconductors in the world. In doing so, the team leveraged a singular behavior of MoS2: When exposed to certain chemicals, the material's atoms rearrange in a way that acts like a switch, forcing a phase transition from a semiconductor to a metallic material. This structure is known as a Schottky diode, which is the junction of a semiconductor with a metal. Parasitic capacitance is an unavoidable situation in electronics where certain materials store a little electrical charge, which slows down the circuit. Lower capacitance, therefore, means increased rectifier speeds and higher operating frequencies. The parasitic capacitance of the researchers' Schottky diode is an order of magnitude smaller than today's state-of-the-art flexible rectifiers, so it is much faster at signal conversion and allows it to capture and convert up to 10 gigahertz of wireless signals. The reported work provides blueprints for other flexible Wi-Fi-to-electricity devices with substantial output and efficiency. The maximum output efficiency for the current device stands at 40 percent, depending on the input power of the Wi-Fi input. At the typical Wi-Fi power level, the power efficiency of the MoS2 rectifier is about 30 percent. For reference, today's best silicon and gallium arsenide rectennas made from rigid, more expensive silicon or gallium arsenide achieve around 50 to 60 percent. In any case, the level of power required to be transferred in air to allow any level of conversion to be efficient enough...well...that much RF power in the air and in the vicinity of humans, is SUICIDE. Please people, get it through your heads, that much RF power in the vicinity of humans.....is deadly to humans. Deadly. Every time. No exceptions, no breaks ---no new science will fix this. RF power, at the levels required for this to work.... in the air.... equals dead humans, 100% of the time, now and forever, as long as humans exist. I have no freaking idea why this insanity keeps coming up as a subject. It's bizarre beyond belief. Even 100% of nothing is still nothing so efficiency does not really matter. Sure possibly some sensor that transmits for a short time each day could be powered by this device but that is about it. It could never power a cellphone from a WIFI signal as claimed. It is a very sad day when MIT publishes garbage like this. As soon as you try to run anything but the most trivial, intermittent display that has to emit light, forget it. You'll be radiating much more power away than you are receiving. Non-backlit LCD might be practical for some applications... A laptop??? Gimme a break!